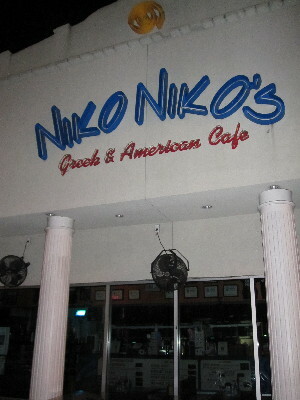 A month back, commenter matternal (Michalis Nikolaou, who noticed that we have the same surname) suggested that if I ever found myself in Houston, I should pay a visit to Niko Niko’s Greek Restaurant, 2520 Montrose, Houston Tx. For that its name was like mine. En route from San Francisco to New Orleans, I found myself in Houston Tx, at 6 am Saturday morning, with three hours between flights. Those who have a life define fulfilment through family, or work, or study, or companionship. Those who have less of a life define it through outré romantic gestures, or their next high. And then there are those who define fulfilment through the occasional ability to indulge in grand follies. I don’t feel fulfilled for it as I take the cab back to George Bush International Airport at 7 am Saturday morning; but I have gone off and committed my grand folly for the week. The grand folly did not cost me a grand; it did cost me close enough to a tenth of a grand for me to be taken aback. Especially because the restaurant only opens at 10 am, so what greeted me was fairly dark, with several restaurant workers just arriving on the site, and looking startled enough that I did not seek to inveigle them into the shots. 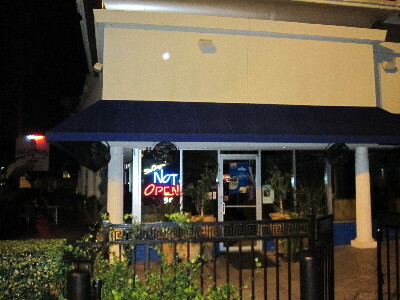 So I can’t really tell you anything about the restaurant, other than what the website shows you. (And the website did not cost me a tenth of a grand to visit.) They serve souvlakis. 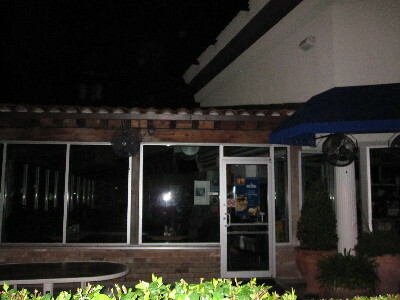 They have a Greek flag in the window. They’re situated on Montrose, which my cab driver informs me is “Half cosmopolitan, half gay”. (I know what he means—half ethnic, half gay; but I’m sure there’s several members of Houston’s gay community who regard themselves as plenty cosmopolitan, and maybe even plenty ethnic.) Their phone number has GYRO in it. The owner has a beard, and looks like me inasmuch as anyone Greek with a beard looks like me. Houston’s downtown looked just as brobdignanian as San Francisco’s, and nothing like Seattle; but I could barely see anything at all at 6:30 am (outside of the donut shops). And I’m disappointing matternal, who I suspect was rather expecting me to visit Houston at a time when Niko Niko’s was open for business (and may even have had him in it). But I doubt I could deal with a souvlaki that time of day anyway. Or most times of day, really. 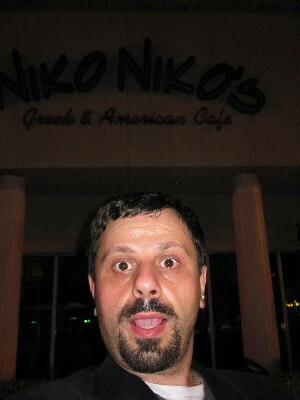 I am conveying an invitation from Niko Niko's for a treat on your next trip to Houston! I am actually surpised you have been so brave as to venture out of Houston Intercontinental in between flights. 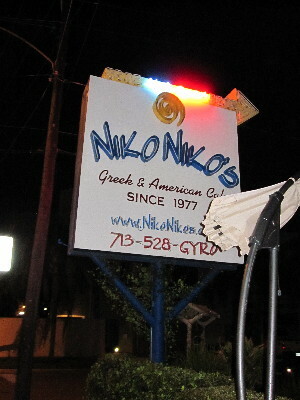 I hope that just the sight of Niko Niko's was rewarding and enticing enough to warrant a second visit. 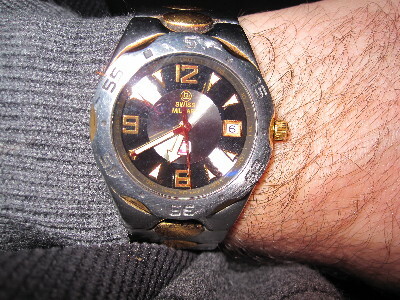 I will alert Dimitri (the restaurant owner) about a certain loyal customer who has not even dined at his place yet. BTW, my offer for my treat next time you are in Houston still stands! Your non-meal experience makes me think of the Greek-owned souvlaki place right next to the Plattsburgh bus station: that was my last U.S. stop before leaving the country for good 12.5 months ago; there was marginal daylight when the bus entered the city (12 hours after I left Oswego and gazed at Lake Ontario for the last time at dawn) but it was completely dark as the bus was leaving the station, and only then I noticed the Greek place, and there and then I hoped that some day I could eat a souvlaki there! And you're going where? New Orleans? I have a Greek flag, 3 x 6 ft., nicely folded on my dressing drawer. I display the flag on special occasions, like when Greece won the 2004 Euro. I hope to permanently display the Κυανόλευκη, one day, in northern Cyprus. The owner has a beard, and looks like me inasmuch as anyone Greek with a beard looks like me.